On a Tuesday evening a few weeks back, I was invited by Birmingham Whisky Club to try a few wee drams of Glenfiddich as part of an blogging / networking event in the cosy little cubby of Bar du Vin. Tonight’s evening featured a talk and taste tour of Glenfiddich distillery’s finest with Glenfiddich brand ambassador Mark Thomson , who gave us a rundown on the history of Glenfiddich and their commitment to single malt whisky. We learned how the distillery was established in 1887 by William Grant in Dufftown, Speyside. And then started off with the 12 yr old and the 18 yr old. 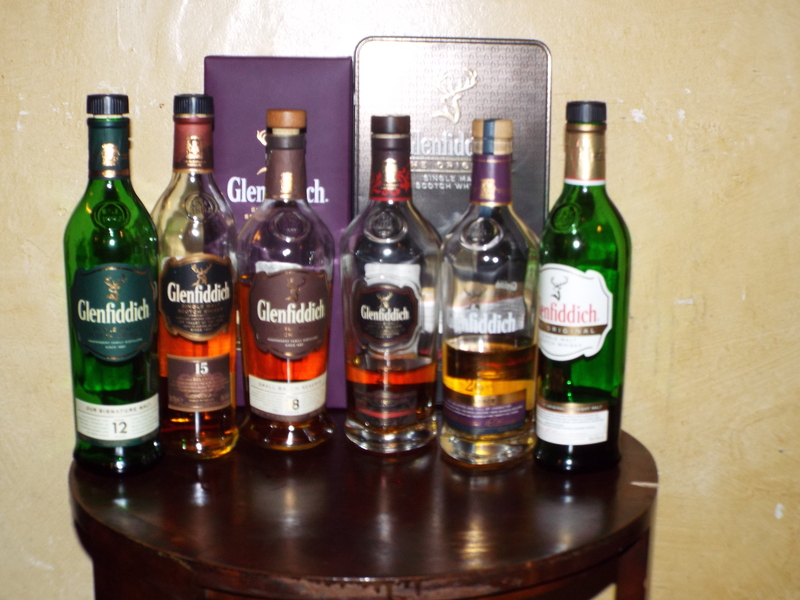 The 12 year old is perhaps the most ubiquitous of Glenfiddich whiskies. It’s certainly one of the world’s most popular single malts. It was the sweetest and lightest of the evenings drinks and definitely had the oak finish in its scent. For me personally, it’s a definite contender for the title of benchmark Speyside single. Next was the 18 year old, which is a robuster version of the 12 year old. Again, it’s finished off in oak casks with a rounder floral and oak finish. The roundness took away the slightly sharper bite of the 12 year old in comparison. After a quick chat about how Glenfiddich was one of the few distilleries to increase production during Prohibition, it was onto the 15 year old. The reason why the 15 year old was out of age order was to explain the Solera method of distillation. Taking inspiration from the sherry bodegas of Spain and Portugal, the whisky is aged in a large oak tun (barrel) which is never emptied and kept half full of whiskies since 1998, giving the whisky a distinct flavour. This gave the whisky a distinctive flavour,with underlying layers of honey and fruit on the nose with a Christmassy taste to the whisky and a definite cinnamon edge. Aged in rum casks gave it a dark golden colour and a Caribbean lilt to the flavour. You could taste the sugar coming through, backed with a smoky undercurrent and a touch of spice. It was the most dry drink of the evening but it left a lovely aftertaste on the palate. Our final two drinks of the night were the 26 year old and the original. The 26 year old is aged in bourbon casks, which also added a rich smoky sweetness. The sweetness was much darker with the bourbon corn rather than rum sugar cane flavour coming through. This gave it a liquorice / vanilla undercurrent to the stronger oaky taste. The final whisky to grace the tastebuds was the original. Mark explained why it was called the original and how Glenfiddich introduced the United States to single malt over blended whisky. In 1963, Sandy Grant Gordon, grandson of founder William Grant, took a case of the original over to New York. This was a gamble at the time as the US was dominated by the blended market and to help it win over, they had engaged legendary 20th century designer Hans Schleger who gave Glenfiddich their distinctive triangular bottle. Unfortunately it wasn’t actually a bottle of 1963; not surprising as they’re over £10,000s a bottle but a modern recreation of the original’s taste. The flavour was more subtle than the modern 12 year old with a hint of pear and vanilla; it was not overly dry with a citrusy finish. It was a great night and my kind thanks to Birmingham Whisky Club for the invite, and Mark Thomson for his wonderful and informative talk. Disclaimer: For this evening, we were guests of Birmingham Whisky Club who provided most of my drinks; this adds no bias to the review. This blog is my own personal opinion and strives to provide an independent view, promoting, enjoying and reviewing the range of exciting food and venues in and around Birmingham.